It was a nice atmosphere at the premiere of the film about the Longhope Route in Kendal on Friday night. 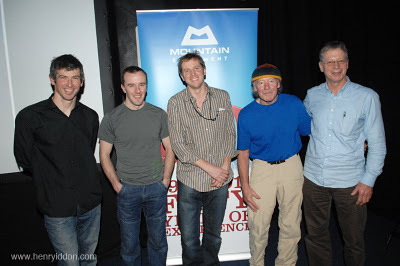 Ed Drummond was on good form to say a few words after the film and it was cool to have 5 of the 6 people who have climbed that route in our various different styles in one place. Thanks to folks who voted for it and gave it the people’s choice award of the Kendal festival. DVD’s are still being made but will be with us soon. Thanks to everyone who has pre-ordered so far. It’s a strange experience presenting a film of a climb like this. For the audience, it’s the first time they’ve been able to see the story really get a feel for this climb. For me, it’s really the end of the process. I was sitting watching it with everyone else, feeling happy with my memories of that cliff. But they are just that - memories. The only meaning it has for me is contained within the film; that watching it will motivate others to have good adventures of their own. Since climbing the route in June, I’ve been doing some basic training, and doing a lot of work (as in bill paying work) to set myself up for next years adventures. I have the restlessness to find new things again! Some projects, like those around my home area of Glen Nevis will come down to training and dedication. There are also some fantastic onsight climbs I’d like to try this winter. After last winter’s time out with an impending new baby I’m looking forward to learning to use the ice axe again. I’ll need to start from a low base, which is always great fun to just enjoy repeating others routes for a little bit.